James Dietz Handsigned and Numbered Limited Edition Print:"Strike Attack"
Size: 16 1/2" x 25"
About the Art: The President of the United States of America, authorized by Act of Congress, March 3, 1863, has awarded in the name of The Congress the Medal of Honor posthumously to: LIEUTENANT COLONEL ROBERT G. COLE UNITED STATES ARMY for conspicuous gallantry and intrepidity at the risk of his life above and beyond the call of duty. Lieutenant Colonel Robert G. Cole distinguished himself with 3d Battalion, 502 Parachute Infantry Regiment, 101st Airborne Division, during combat operations on 11 June 1944 in France. 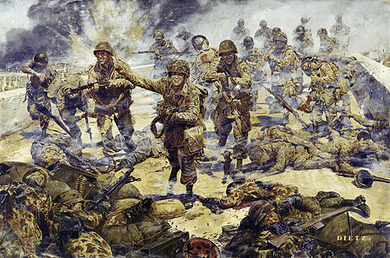 LTC Cole was personally leading his battalion in forcing the last of four bridges on the road to Carentan when his entire unit was suddenly pinned to the ground by intense and withering enemy rifle, machine-gun, mortar, and artillery fire placed upon them from well prepared and heavily fortified positions within 150 yards of the foremost elements. After the devastating and unceasing enemy fire had for over one hour prevented any move and inflicted numerous casualties, LTC Cole, observing this almost hopeless situation, courageously issued orders to assault the enemy positions with fixed bayonets. With utter disregard for his own safety and completely ignoring the enemy fire, he arose to his feet in front of his battalion, and, with drawn pistol, shouted to his men to follow him in the assault. Catching up a fallen man's rifle and bayonet, he charged on and led the remnants of his battalion across the bullet-swept open ground and into the enemy position. His heroic and valiant action so inspired his men that it resulted in the complete establishment of the bridgehead across the Douve River. The cool fearlessness, personal bravery, and outstanding leadership displayed by LTC Cole reflect great credit upon himself and are worthy of the highest praise in the military service.